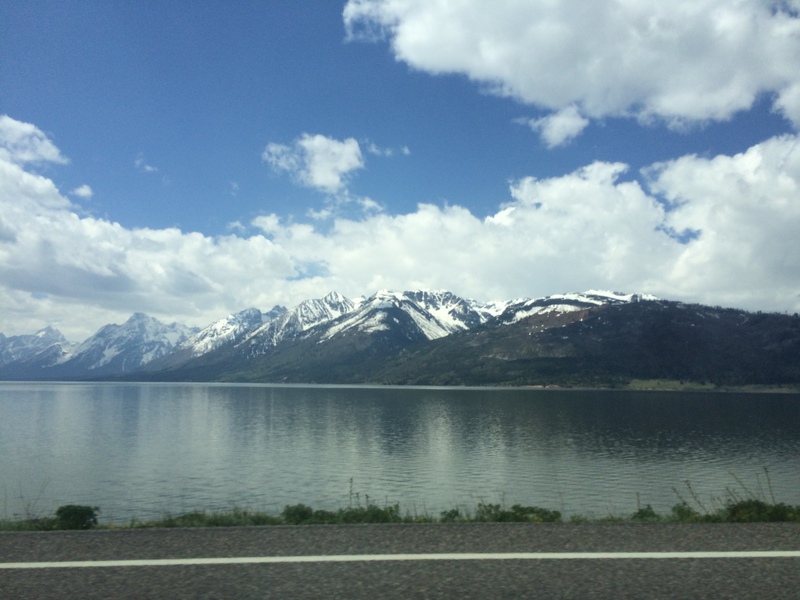 A little over a month ago, I had the opportunity to take a three-credit field course at a camp surrounded by mountains in Jackson Hole, Wyoming. It was honestly one of the best experiences I’ve ever had. The duration of the course was three weeks, but since we drove to and from Wyoming, we spent about six days just in transportation. The topic of the class was energy – primarily production, consumption, and policy. In addition to receiving lectures and completing assignments, we had the chance to learn from the field. We visited a uranium mine, nuclear testing reactor, wind farm, fracking operation, and two hydroelectric plants. I found it incredible and fascinating to be able to see exactly where our energy comes from and how it gets to our homes, but I was also just awed at how much we’re able to do. I still can’t get over the fact that we are literally able to pump uranium atoms out of the ground with water and fission them for energy. And although I was shocked by the inefficiencies and environmental impacts of coal and the outdatedness of our current power grid, with all of the options and technological breakthroughs out there, I’d like to remain optimistic about the future of energy – both in the U.S. and in the world. Aside from being thoroughly enlightened by the actual content of the course (believe me, I could talk about it forever), I was also able to spend some time in the Tetons and in Yellowstone National Park. It was my first time out west and my first time hiking through the mountains. And it was breathtaking. I’m not sure I can begin to describe what it felt like up there in the grandeur and solitude of nature. It reminded me of all those wilderness and survival books I used to read – like Hatchett, My Side of the Mountain, and The Cay. I felt like one of those characters, off on a great adventure. Oh, and to gaze upon the stars at night! There’s something magnificent yet somewhat unsettling about looking up at the stars. It just puts things in perspective in a way we don’t get to experience during a typical day. The universe is so vast, and there’s so much more out there than the little bubble of our lives in which we’re so wrapped up. Isn’t it incredible that life on our planet depends on a burning ball of gas more than ninety million miles away? It blows my mind just thinking about it. Yellowstone was also pretty amazing, although not quite what I expected. 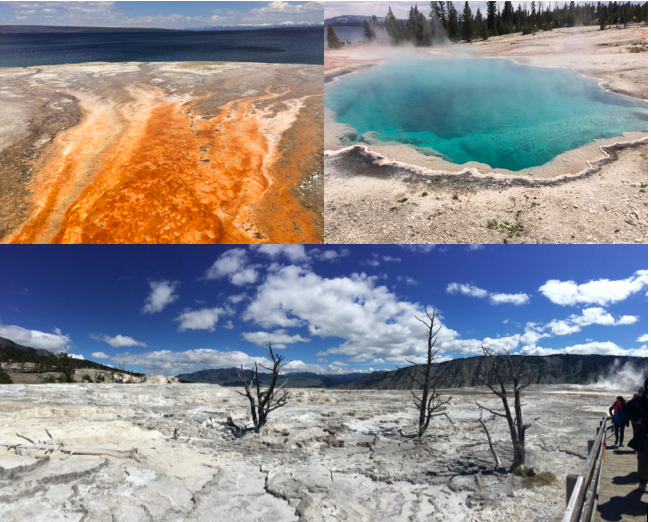 It’s amazing because although rife with wildlife (namely bison), it’s also home to incredibly acidic environments that look like an alien landscape. It was like being in some kind of science fiction movie! 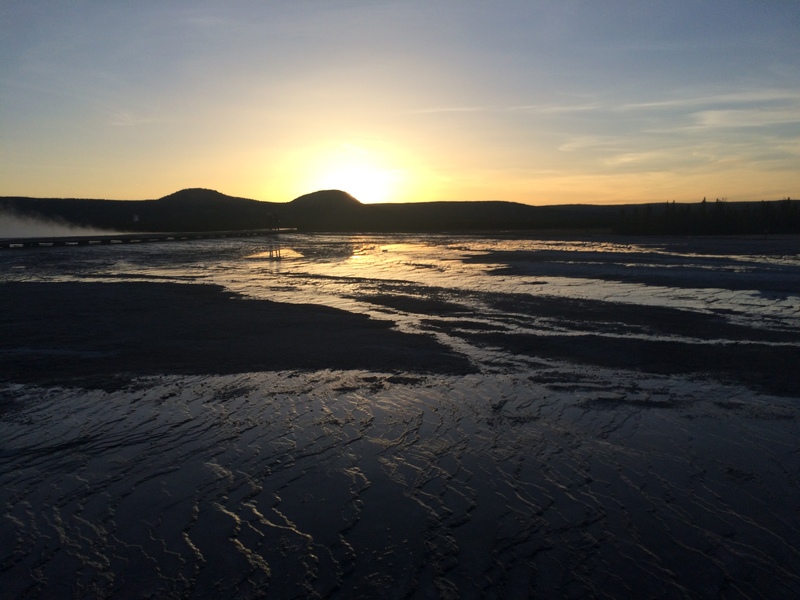 The vast thermal landscape, barren except for a few hardy shrubs and hot, bubbling pools of acidic water. Not to mention the geysers constantly emitting steam. I don’t think any other place like Yellowstone exists on Earth. Looking up at stars and mountains, down into a canyon, and upon all the natural wonders of Yellowstone was quite an eye-opening experience. If I didn’t find our planet incredible before, I definitely do now. I think Einstein was right when he said there are only two ways to live life: one as though nothing is a miracle, and one as though everything is a miracle. And I know which one I’m living. I apologize for the immense delay in posting, but winter semester of college was pretty hectic, and not long afterwards, I embarked on an international journey. For three weeks in May, I had the amazing opportunity to volunteer at a nursery school in Rabat, Morocco with three of my closest friends. It was an experience I’ll never forget – for more reasons than one. Of course walking into a room and having about forty little kids get super excited to see us every single day was extremely rewarding, but so was immersing ourselves in the culture and learning how to make Moroccan mint tea, planning weekend trips to other cities and having to find the train station and book hotels all on our own, and figuring out how to communicate with people without being able to speak Dareeja (Moroccan Arabic). Even battling a fierce cockroach to the death was rewarding in its own way (albeit terrifying). Five days a week we spent at the nursery school in Rabat. We taught a little bit of English (ABCs, shapes, numbers) and games like “Duck, Duck, Goose” and musical chairs. We also created activities like coloring and connect-the-dots worksheets. For me, the highlight of the trip was definitely the kids. Each kid had his/her own unique personality, and they all loved the attention we were able to give them. We’d just be sitting there and suddenly kids would climb into our laps or want high fives or give us kisses. 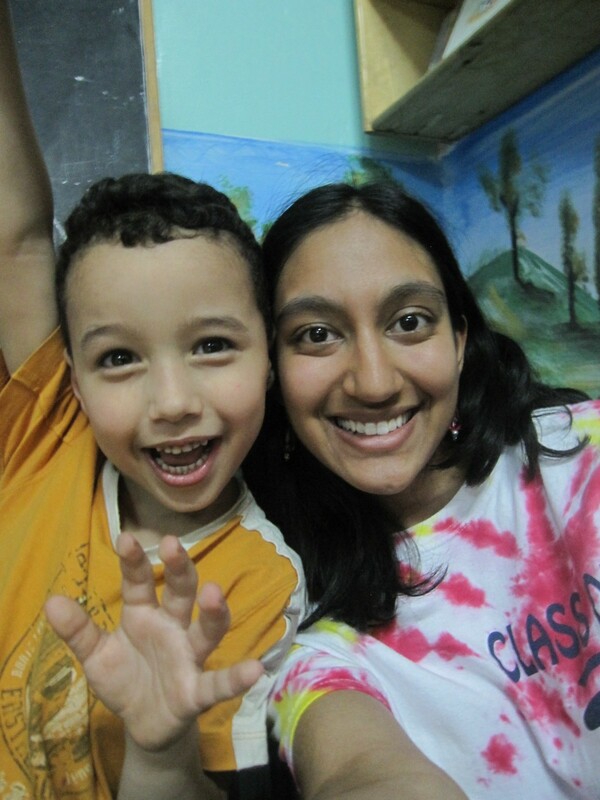 Suhail was one of the most enthusiastic and energetic kids there! 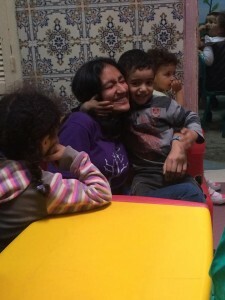 Yusuf, one of the little kids at the nursery, would not let go of me! On the weekends, we took the train to other cities in Morocco. We traveled to Fez, Marrakesh, and Casablanca. While the cities themselves were beautiful and exciting to visit, I honestly just loved the notion of grabbing our backpacks and hopping on a train to somewhere. I think that was when we felt most independent and truly adventurous. And some of our best (and funniest) memories were created on the train. The other really nice thing about our trip was that we lived with host families during our stay in Rabat. Some aspects were challenging (my host mother did not speak any English), but this meant I had a chance to practice using the basic Arabic that I knew. 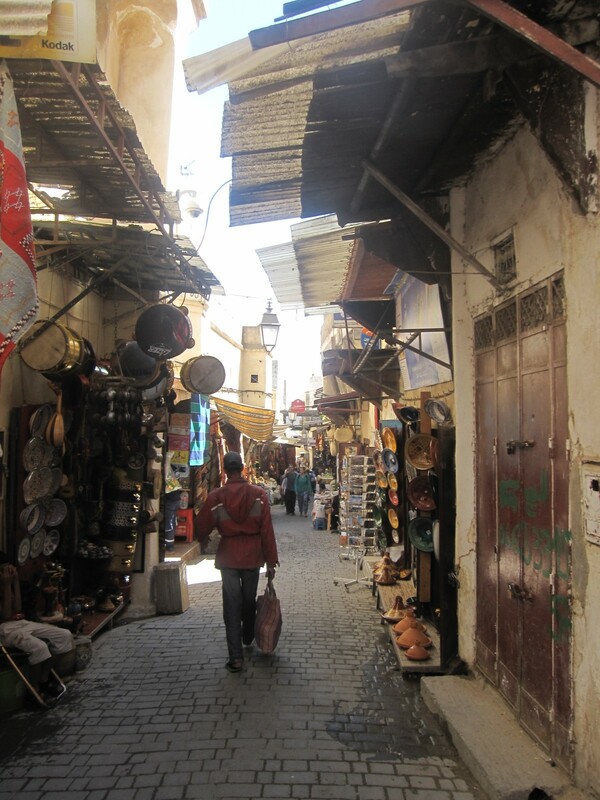 Our host families also lived within the walls of the medina, or the old city, which is basically a maze of narrow streets crammed with shops and markets, called souks. At first the prospect of finding our way through this veritable labyrinth was quite daunting, but soon we knew exactly how to get back to our homes and felt comfortable exploring on our own. Living in the medina itself really added to our experience. A street in the medina in Fez. Every city has its own medina. Living with host families also meant home-cooked meals. And my host mother was an amazing cook! 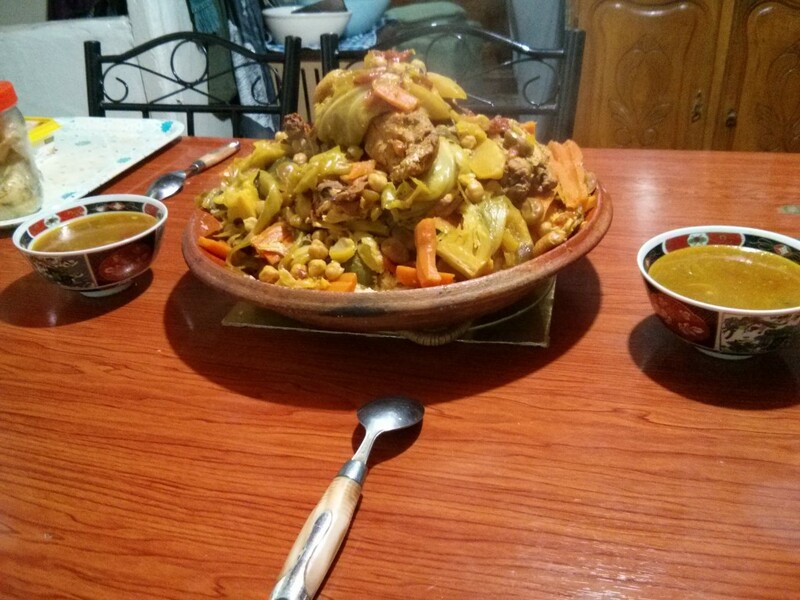 My host mother’s fabulous couscous, the traditional Moroccan dish that is eaten on Fridays. Morocco was a whirlwind of new experiences, all of which we had to navigate ourselves. For me – someone who likes having things planned and organized – this trip was the best thing that could have happened. I realized that not knowing where you’re going all the time and having to figure stuff out on the way isn’t so bad. In fact, it can be a lot of fun, especially when you’re with friends. The best part is that now I feel a lot more comfortable figuring things out for myself as well, whatever they may be. So here’s to the wonderful unplanned adventures the future holds, and here’s to figuring them all out!